How to install a backyard basketball court. 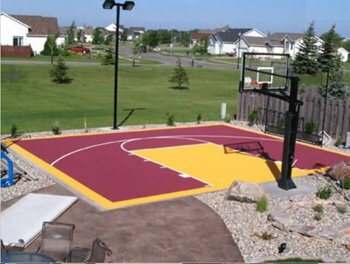 Large or small, backyard basketball court, or outdoor game court, we'll help with ideas on how to lower costs & help make the best size court for your diy project. There are many things to consider when building a backyard basketball or tennis court. 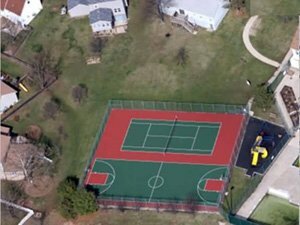 Basketball-Goals.com sells court equipment and court tiles to help the do-it-yourselfer build an entire basketball, tennis, or multisport court in their own backyard. The preferred subsurface for our tile is a concrete pad, or asphalt pad however our tile can also be placed over crushed rolled stone dust, stone dust doesnt hold level however so it would require that it be rolled once a year to maintain level. Before attempting to install any backyard basketball or tennis court is important that you first check with your local building code officials to make sure it is permitted in your particular area. In most areas of the country it's perfectly fine to install a concrete slab or asphalt pad in your backyard. Some cities however may have restrictions regarding what can and cannot be put on to a home owners property. It's better to check with local code officials first instead of having to be told later that you must remove it. It's also good idea to check with your local wetlands enforcement official to make sure all laws and ordinances are being adhered to, you may even need to check your homeowners associations bylaws to see if this is a permitted use. Let's say you've gotten the go-ahead to be able to install a concrete pad. The best way to go about doing this in our opinion is to contact the local concrete manufacturing facility. Typically you'll see their trucks on local roadways and most likely recognize their name on the trucks. Call these places directly and ask that they referredyou to at least three companies that they can recommend who perform flat work in your area. Concrete companies will typically not give you an unreliable recommendation because their name is on the line. They will point you to companies that they do business with on a daily basis that they trust will do a good job. These companies might be landscape companies, patio designers, or local builders. Ask each one of the companies to come out to your house and give you a quote on installing concrete or asphalt slab in your backyard court. Tell them that the slab that you want to have installed is to be a 4 to 6 inch concrete slab with a broom swept finish. The slab is to be angled long side to long side for drainage 1 inch in every 10 feet. For a detailed list of concrete specifications for full court applications click here. Slab may also be crowned in the middle for drainage like a road. If you want to have basketball equipment installed it will require separate footing for each goal that are much deeper than the slab (refer to the manufacturers assembly instructions or consult one of our sales people here at Basketball-Goals.com) ask they include the cost of installing the footing for your equipment in the quote as well typically basketball equipment will be installed on a separate footing just outside of the main slab. If you have other equipment such as SoftNet fencing, rebounders tennis court posts volleyball posts or any other type of equipment that you want installed asked that they include that separately as a line item in their quote. If you're going to have lighting installed it's a good idea to also have an electrician give you a quote for laying out the conduit and hooking up the electrical wiring that's required. It is important to note that if you intend on installing basketball equipment or other sports equipment that gets anchored to the concrete or asphalt that you take delivery of that merchandise prior to having your slab poured. The reason for this is that most of these pieces of equipment will require an anchoring system or ground sleeves installed into the wet concrete and then the rest of the equipment attached after the concrete dries and is cured. Once you have decided on the subcontractor that will do the work for you do not pay for the project until all work is completed and you are satisfied the job has been done. Some subcontractors may ask for an upfront payment in this case we recommend paying in thirds one third to begin the job, one third after most of the job is finished, and one third when the job is completed to your satisfaction. Basketball-Goals.com carries a complete line of basketball and court equipment. We are the Internet's number one reseller for Versa Court sports tile. These tiles are excellent for creating backyard basketball courts, tennis courts and multi sport game courts. We can have one custom designed with prepainted game lines at the factory according to your specifications. You can even have your favorite team's logo or a logo of your own choosing painted onto your court. Installation is a breeze click here to check out the video which shows you how easy it is to do. We have basketball goals, multisport nets, volleyball and tennis equipment, SoftNet fencing, lighting, rebounders, and much much more..
We hope that you have found this information to be helpful and we ask that if you have any questions or require any assistance with your backyard court that you call Basketball-Goals.com toll-free at 866-892-7277 we will be happy to help in any way we can. If you would like a quote on any of the merchandise mentioned in this document click here to let us know and we'll send you a quote by e-mail right away.